Really, what vegetarian cooking series doesn’t have a meatless chili? Its sort of like a vegetarian cookbook without tofu. Okay well I would write a vegetarian cookbook without tofu because I’m not really a fan of it, but that is besides the point. This chili is interesting, which I’m sure makes you want to run and make it right away, but give me another minute here. I did quite a bit of recipe research before making this, because I am squarely in the beans and meat chili camp, I’ve had some mildly decent just bean chilies but I usually want something more. I’ve also had vegetarian chili that tries to blow you away with spice, as if you can’t taste anything but chili powder you won’t miss the meat. Neither one had me coming back for seconds. Just like Bon Appetit’s California Chili, this chili will probably make Texan’s skin crawl and would proudly deserves the title of California chili with its avocado, peppers, and sweet potatoes. The sweetness of the sweet potatoes are nicely offset by the spice of chili powder, cumin, and a poblano pepper. It is even better the next day in a whole wheat tortilla with a farm fresh egg for a quick breakfast burrito. I feel I must warn you and stand up for this sweet chili, it also has orange juice in it. Which, I know, sounds odd. I thought so at first too. Even after my first bit I was unsure, but it won me over. You must know that this isn’t a blow your socks off hot chili, it is sweet with a nice soft heat. Which makes it perfect for kids and those who aren’t a fan of a runny nose and burning lips over the dinner table, but if you are a die-hard chili fanatic, this probably isn’t for you. For the rest of us, who want a nice simple dinner with a mouth-full of flavor, pick out a good movie and cuddle down for a warm evening in. EDIT (2/2/11): I just realized I forgot some things in the ingredient list! Gah! It is corrected now. The original recipe calls for sautéed polenta triangles, I skipped those this time but we decided as we were eating it with sweet cornbread that it would be better with the polenta. So, get directions for those here. Heat oil in heavy large pot over medium heat. Add the onions and sauté until tender, about 10 minutes. Add ginger, chili powder and cumin and stir, and cook until fragrant, about 2 minutes. Add sweet potatoes, orange juice, broth, tomatoes, and garlic and bring to boil. I thinned it down a bit with an extra cup of water. Reduce heat, cover and simmer until sweet potatoes are almost tender, about 10-15 minutes. Add the beans, poblano chilies and bell pepper into sweet potato mixture. Cover and simmer until chilies are tender, about 15 minutes. Add salt and pepper to taste, I think I also added a bit more cumin at this point. Serve with avocado, cheese, or sour cream. In my opinion, the avocado is a must! 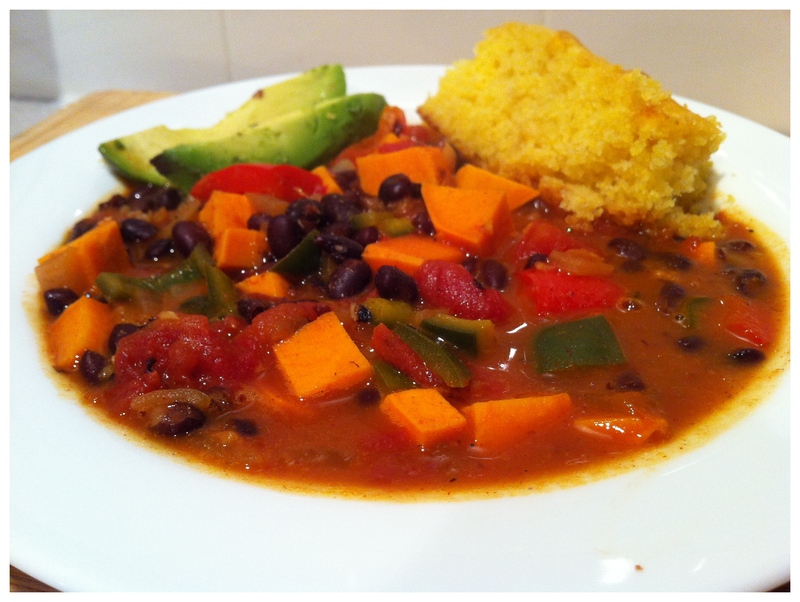 This entry was posted in Quick dinner, Recipe, Soup, Vegetarian and tagged Recipe, Soup/Stew/Chili, Vegetarian. Bookmark the permalink.